AXIOM annunciated a first sampling of the carbon off-gas at the biogas plant in Bruck an der Leitha, Austria, that was chosen as the carbon source for the project. In line with the project schedule, AXIOM filled eight gas bags this month and distributed them amongst the laboratories that will analyse the composition of the biogas upgrading off-gas stream. Preparing the deliverable “Valorisation of biogenic CO2-sources for chemical production”, EIJKU gave a broad overview on potential sources, showing that biogenic CO2 can provide lowest capture costs. The techno-economic assessment of the technology will be conducted through simulation with the Power-to-Gas Assessment Tool PResTiGE. SG and SIEMENS presented first results of the catalytic coating for the PEM cell that will perform the reduction of CO2 and H2O. The coating was successfully applied but does not yet show the expected results in terms of electrical conductivity. In the next steps SG and SIEMENS will perform experiments with the thickness of the copper layer. 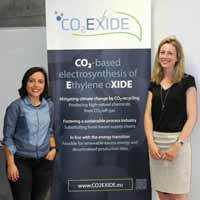 The creation of the communication materials for CO2EXIDE reaches its final stage. Project website, presentation, card, roll-up and project film were presented at the meeting. EPC announces the completion and implementation of both internal and external newsletter, project brochure and poster for this autumn. The next stages of the communication and dissemination campaign that accompanies the project will focus on dissemination and exploitation of results as well as developing of networking strategies in order to amplify its impact. The reports from the eight work packages showed the project is just progressing in accordance to its timeline. 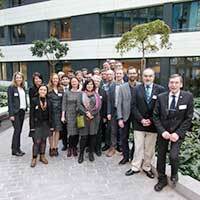 For the next partner meeting, first research results are expected from AGH, Fraunhofer and SOTON. The next project partner meeting will take place on the 12th and 13th of December 2018 in Warszaw, Poland and will be hosted by AGH.